A year ago I put a new chain on my Marinoni. It skipped ike mad over the cassette so I just put the old chain on (and committed the sin of re-using the chain pin) and figured I'd squeak a few more miles out of the whole works. Then winter came and went (along with the abrasive road grit). and still the drivetrain worked well. When Spring hit, I started wondering how much life it had left, but things were still very smooth with pedalling and shifting. There was one gear that it consistently missed on the downshift. No big deal. On my way to work a few weeks my chain decided enough was enough. "I'm outta here." It said. "I'll be inside grabbing a Coke." There I sat, outside the Richmond Coca-Cola factory removing the broken chainlink, shortening my chain and getting good and greasy. 10s of thousands of miles I've carried a chainbreaker. Today I got to use it on the side of the road. 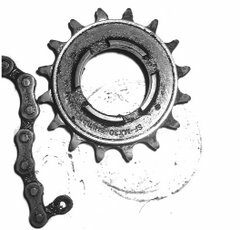 The original Campagnolo Veloce drivetrain lasted me 10000+ km (I reckon 12) before it decided to pass. And yes, if you are curious, the pin that broke was the pin that I re-used.